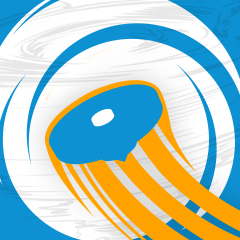 Our worldwide ranking system for pariticipants of WBO Organized Play Beyblade tournaments has regrettably been out of commission for some time now due to problems which occurred after the launch of our new site design on our eighth anniversary. 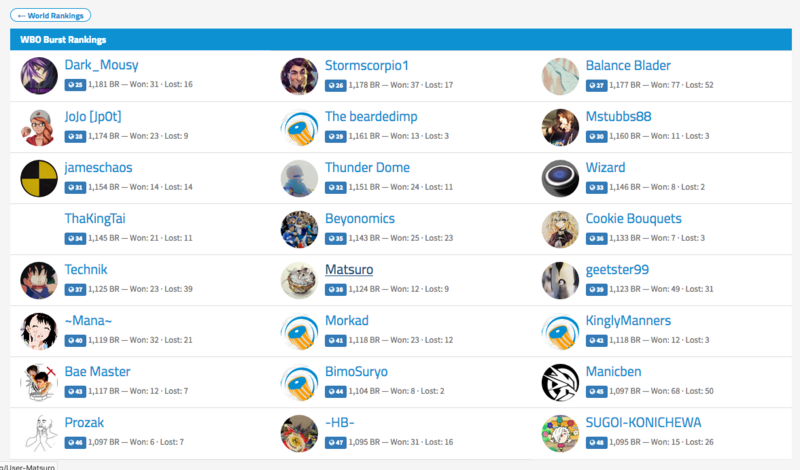 But we’re happy to announce that the ranking system is now working again! 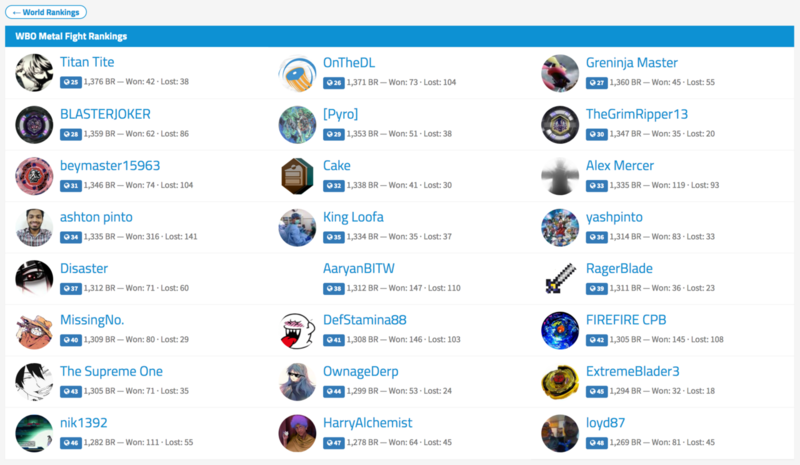 We have more features coming in the near future relating to our ranking system (battle profiles and notifications for tournaments near you, to name a couple), but with this latest update some key new features have now been added which will make processing events much easier and quicker for everybody. 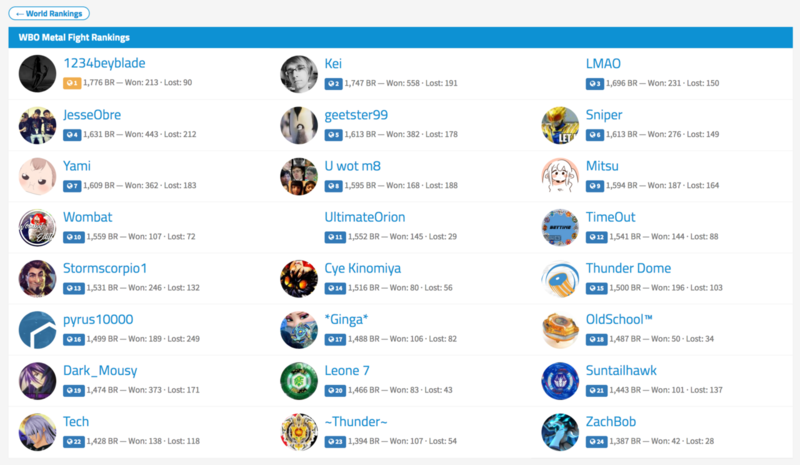 Previously, each battle for each tournament required the winner and the loser to be manually input on the back-end of the site, accessible only to administrators. This has made for an enormous amount of work for the WBO Committee over the years. It was inefficient. 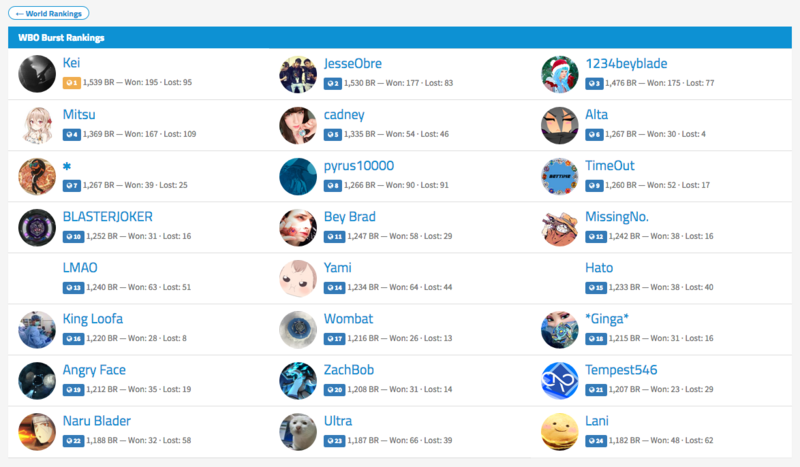 With this new system, winners can be pasted into one column and losers into another column, allowing for all matches to be added essentially instantly for review before approval. A “Winners” button will now appear for Organizers on their event page (not other event pages created by someone else) below its main description after their event has passed. This will allow them to pre-process their results directly to our system after completing and posting their results spreadsheet. The results will not be added to the rankings immediately as we still need to do a final review to ensure everything is correct, but Organizers who choose to do this will help speed up the process for everyone immensely. And it will only take an extra couple minutes to do. Pre-Processing “Winners” Screen. Visible only to Organizers on their Event Page after their event has passed. Organizers can simply copy and paste the winners and losers from their results spreadsheet all at once. Once a Committee Member has reviewed and approved the results, they will be added to the rankings. Organizers, please check the Organizers’ Circle forum for a video tutorial and more details on how to do this. 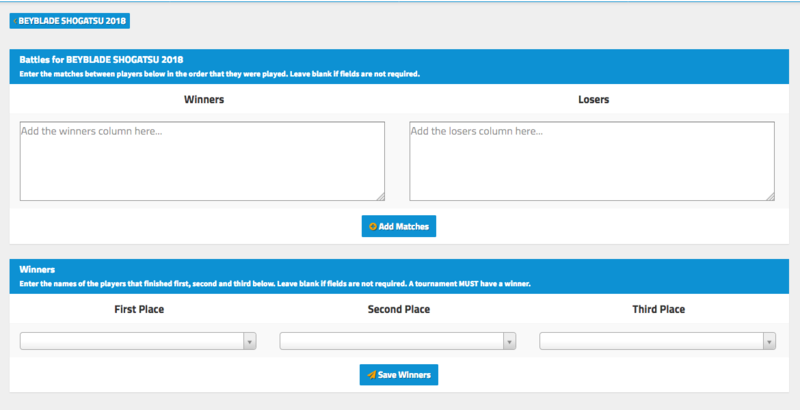 Organizers can also submit the top three players when submitting their results using the above method. Once the accompanying results have been approved, these three winners will be displayed on the thread itself showing that they won the tournament! 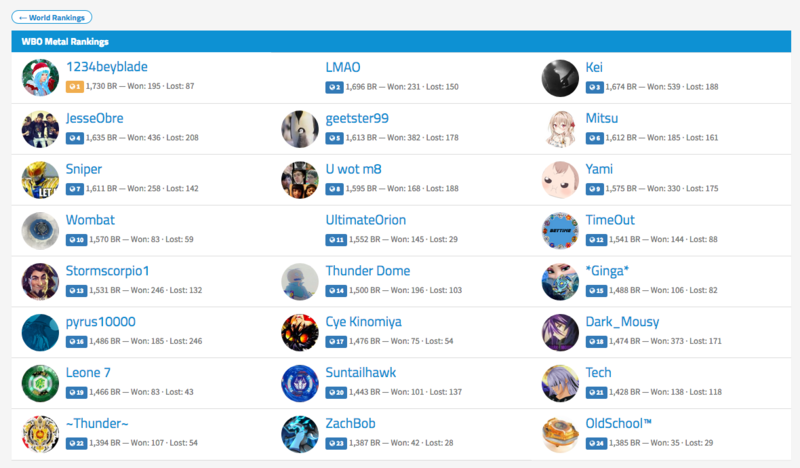 In the future, we also plan to have the ability to review the specific results for any given tournament on the event pages themselves so that it will be easy to identify how everyone did in the event you attended. This archive will be updated gradually as the tournaments are processed. Once a tournament is fully processed (results, Bits, and Credits), it will be moved to the corresponding sheet for the format it belongs to (ex. a Burst Format event will be moved to the BST Archive sheet from the Unprocessed Tournaments sheet). We will be prioritizing ranked and Burst tournaments first so that we can finally get the rankings up to date again. Credits will be added, but cannot be spent until we get closer to completing the queue. We will announce when Credits may be used again. Rather than going on a blitz and trying to complete everything as quickly as possible, we will be taking our time with the processing of the results in order to provide the opportunity for the players involved to review the results after they have been processed. We don’t want to process 10 tournaments and then have someone say “a battle was missing” or “this result was wrong”! Doing it slowly will also give us the opportunity to more easily assess who needs to be awarded the Platinum Bit (for reaching the Top 5 in the Burst or Metal Fight Rankings) and to capture a list of what the Top 15 or so looked like over the past year or so at any given time. We’d like to thank everyone for their immense patience over the past year plus since the rankings went down and for their patience moving forward as we start to move through the queue of past events. We’ve been committed to getting the system back up and running since it went down, but it’s become incredibly complex, especially given the eight years worth of results currently processed within it and the additional features we wanted to add. It took longer than we would have liked to get the new features added, but we feel that with the features described here (and even more improvements we are planning in the future), it will be the best thing for us in the long run in terms of being able to efficiently process events and reduce our workload, which will in turn allow us to spend more time working on other improvements to the site. Nice were back in the game. Happy to let you all know that we've finally caught the rankings up to just before BeyDays 2017! We've still got a long ways to go, but things are progressing steadily (barring any issues like missing users, which delayed this announcement by a month or so). A huge portion of the tournaments at and beyond BeyDays 2017 are already pre-processed thanks to the new system described in the opening post of this thread, so it should be smooth sailing for the most part. 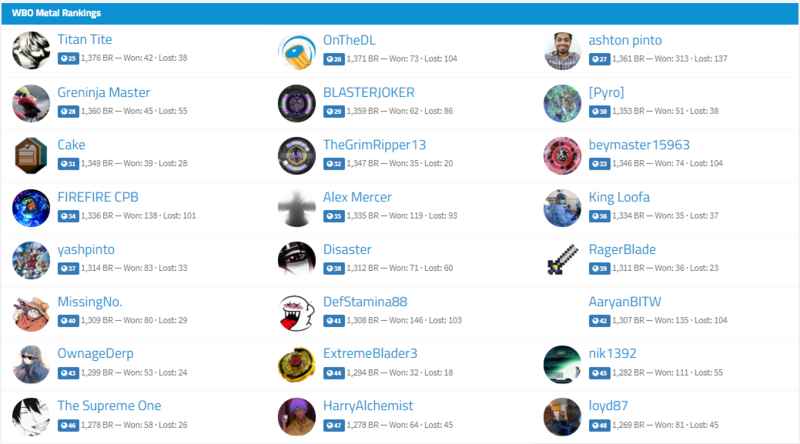 At this point in time it also seemed appropriate to finally award the prestigious Platinum Bit for the first time to each of the Top 5 Bladers in the Burst Rankings! 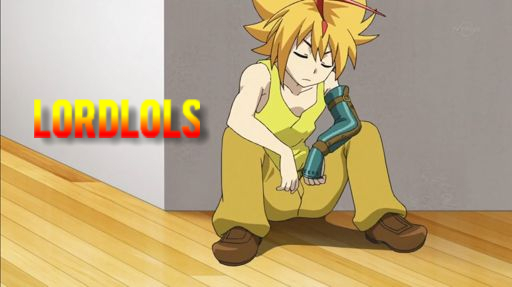 Congratulations to JesseObre, 1234beyblade, Mitsu, cadney, and ... me haha. 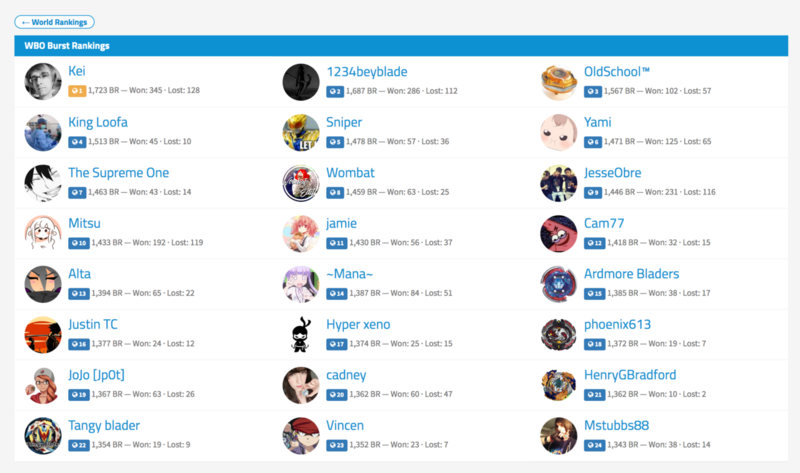 From this point onwards anyone who enters the Top 5 in the Burst Rankings will receive the Platinum Bit. Good luck! All of them already have the Platinum Bit for that. There was no change from before haha. 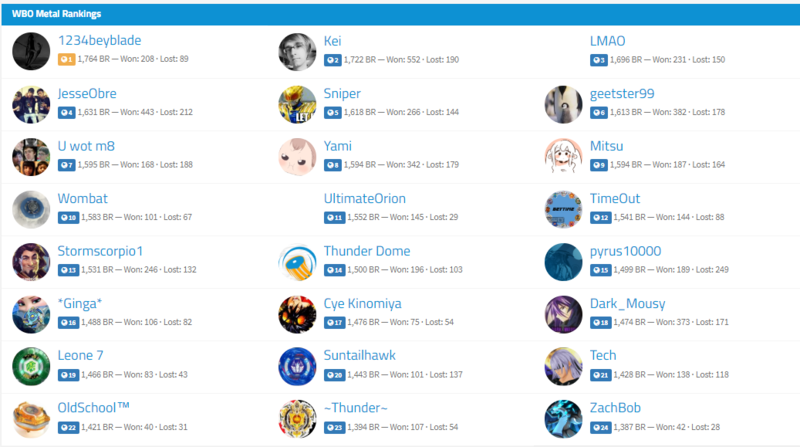 Although, poor Mitsu is just one point away from being tied with geetster99, and Sniper just two points away! We are now caught up to almost the end of July 2017 for ranked events. There's an issue with "Rowdy in the Dish 2" blocking our progress currently, and a few issues with multiple LA events on the horizon (hosts have been contacted in both cases), but beyond that most events for 2017 have either been pre-processed already or we have the results spreadsheet available to do so. Wow, almost a year after the fact, We're glad to announce that we are all caught up with the 2017 rankings! We still have a while to go before being completely up to date, though it's been far easier to get results pre-processed for 2018 since tournaments have happened more recently. With that said though, what Organizers can do to help speed up this process even further is to submit any results spreadsheets, fees, and winning combos as soon after the event as possible, as well as pre-process their own tournaments. Between Beydays and the end of 2017, a couple new users have risen to the Top 5 in either the MFB or Burst rankings: Sniper, who passed geetster99 for the #5 MFB spot after a 3rd place finish at Kei Spectates The World: MFL, and OldSchool™, whose two breakout performances at WELCOME TO A&C GAMES V and VI launched him upwards nearly 200 points and into the #5 spot for Burst! So happy to finally get through 2017! Thanks so much to everyone who helped to make that possible. Organizers: please don't forget to continue submitting your results on time and pre-processing them if you have time. It's a huge help to us and the community. Nice idea adding those win rate percentages Wombat. I've always thought that would be an interesting stat to show. Also pretty interesting to note that the win rate percentage for myself, 1234beyblade, and JesseObre is basically the same for both formats. And King Loofa nearly at that coveted 80% win rate! Amazing. 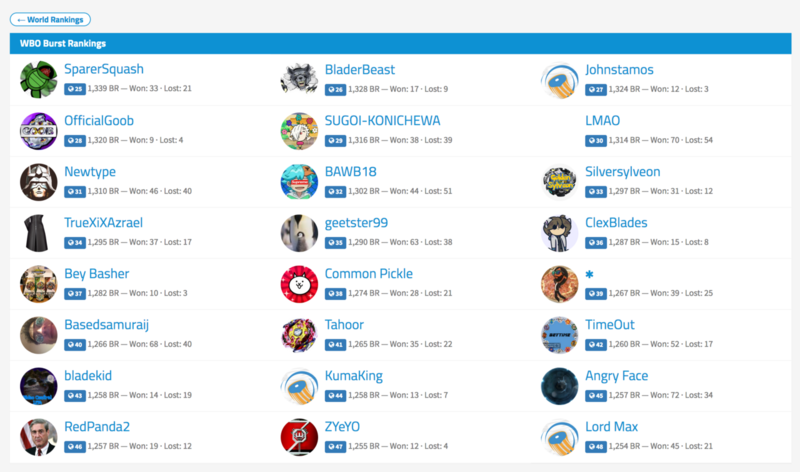 A strong showing at Beytuber Brawl pushed King Loofa into the Top 5 of the Burst Rankings, making him the latest recipient of the Platinum Bit. Congratulations! 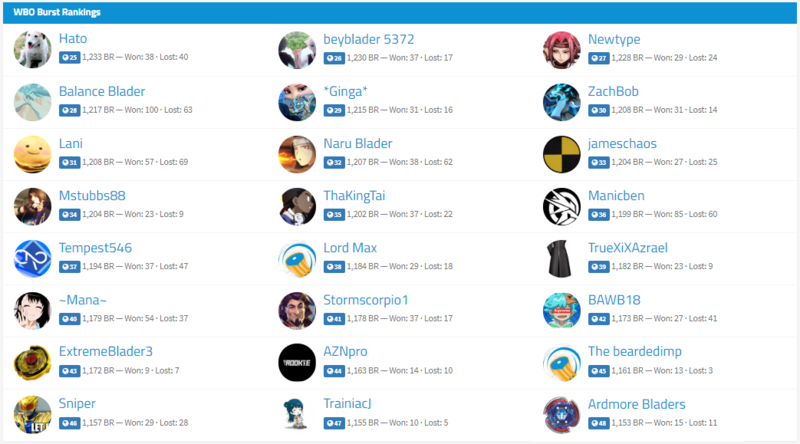 And Sniper also cracked the Top 5 after a third place finish at BEYBLADE NORTH 2018 [Saturday]! King Loofa was able to break through the 80% winrate barrier. Pretty amazing. 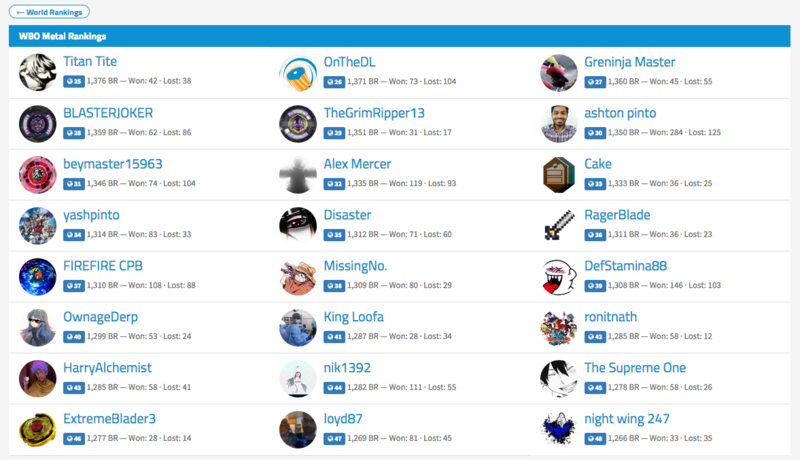 Across the Top 10 in both MFB and Burst, no one is really even close to matching that at this moment. The award for most improved goes to ... OldSchool in the Burst Rankings! The last update we posted his winrate was at 54.6%, but this time it has shot up to 64.1%! Unsurprisingly, there wasn’t much movement on the Metal Rankings. 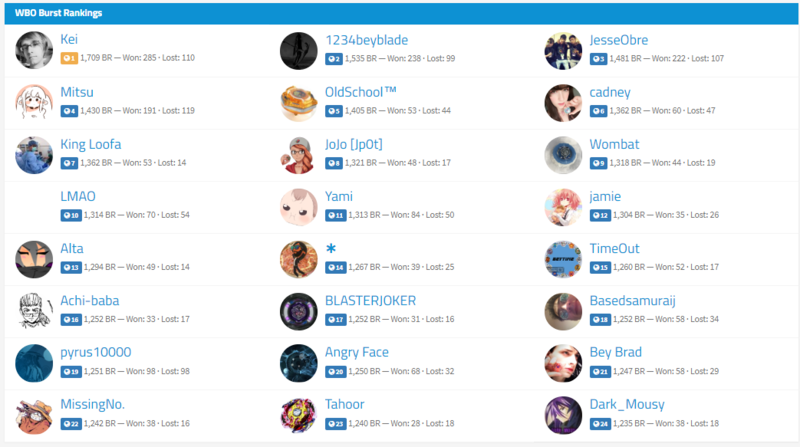 1234beyblade and I both padded our lead a little bit due to good performances at BEYBLADE NORTH 2018 [Friday]. Although, I have an upcoming MFL event which I didn’t do so great in (4-3), so I imagine I’ll be moving down closer to 1,700-1,710. The Supreme One jumped into the Top 10 for the first time! Her winrate is pretty impressive.